FZT1147A 12V PNP MEDIUM POWER HIGH GAIN TRANSISTOR IN SOT223 View Diodes Incorporated. FZT788B 15V PNP MEDIUM POWER HIGH GAIN TRANSISTOR IN SOT223 View Diodes Incorporated. 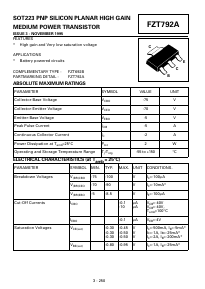 ZTX795A PNP SILICON PLANAR MEDIUM POWER HIGH GAIN TRANSISTOR View Diodes Incorporated. FZT694B 120V NPN MEDIUM POWER HIGH GAIN TRANSISTOR IN SOT223 View Diodes Incorporated.